Flanked by two volcanoes on a stunning crescent-shaped bay, Hilo is a gateway to the rest of the Hawaiian Islands on your Azamara Club Cruises’ voyage. Blessed with fertile lands and a warm tropical rainforest climate, Hilo is a haven for fresh produce. Stroll through the Hilo Farmers Market—one of the best open markets in Hawaii—and taste fresh fruit while perusing stalls full of local goods. Walk along the streets of its charming downtown, stopping to learn more about the area’s fascinating history and flavor at the Lyman Museum, neighboring art galleries, and bustling restaurants. Discover over 60 species of animals at the Pana’ewa Rainforest Zoo. Stargaze at the state-of-the-art ‘Imiloa Astronomy Center. Learn about the region’s history of seismic activity at Hawaii’s only Tsunami Museum and explore its rich marine biodiversity at the Mokupāpapa Discovery Center. A short drive from Downtown Hilo, paradise awaits. 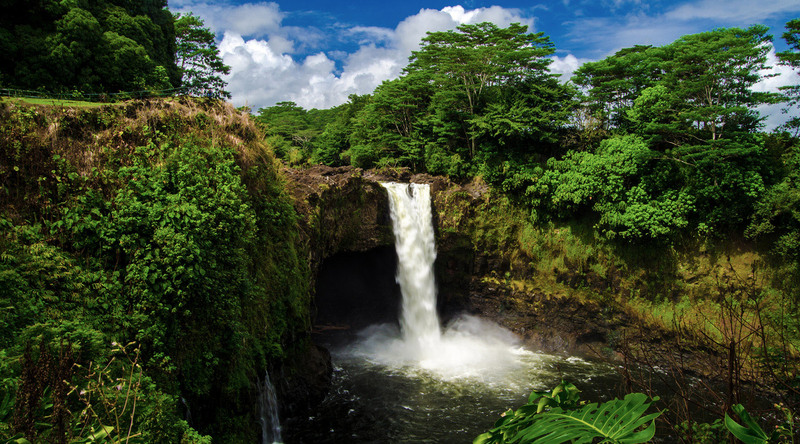 Take in amazing waterfalls at the Wailuku River and Akaka Falls State Parks. Hike the charred craters and forests surrounding the Mauna Loa and Kilauea volcanoes. Experience the essence of Hawaiian culture from this emerald in the Pacific. Named after Hawaii’s last reigning monarch Queen Liliuokalani, experience a peaceful moment within the grounds of the largest authentic Japanese garden outside of Japan. Over 30 acres of lush gardens offer elegantly designed fishponds, pagodas, and rock gardens. Walk along Banyan Drive to discover arching bridges, a teahouse, and stunning views of Hilo Bay in a gorgeous park setting that pays homage to Hawaii’s first Japanese immigrants. A must-see location just 45 minutes south of Hilo. Explore an extraordinary range of natural diversity within this UNESCO World Biosphere and Heritage site that offers stunning views, dramatic waterfalls, lush rainforests, and blooming tropical gardens. Hike trails through ashen tails of volcanic craters. Watch hot lava ooze out of Mount Kilauea into the bright sea below. Experience this once-in-a-lifetime opportunity in one of Hawaii’s most sacred places. Discover this newly built world-class attraction. Housed in three titanium cones designed to represent the tallest mountains on the Island, the Center includes a 120-seat planetarium and full dome video projection system. Learn about Polynesian voyagers at one of the many bilingual exhibits. Catch a 3D presentation of “Birth of the Universe”. Tour ‘Imola’s extensive gardens and peruse its gift shop for an out of this world souvenir. Discover three of Hilo's favorite attractions on an excursion that takes you to a local zoo, a macadamia nut Factory and spectacular Akaka Falls. Journey up the slopes of Hawaii's volcanic landscape to reach a unique winery some 4,000 feet above sea level for an exclusive tour and tasting. Join a group of no more than 13 guests on a quest to discover the lava flows, black sands, and thermal ponds of Puna.